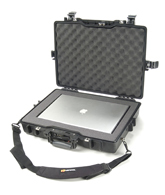 Whether you need a case for one laptop or you need to outfit a whole sales team at the next trade show, UFP Technologies has the solution for you. 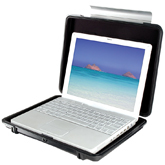 Interior Dimensions: 12.80" x 9.80" x 1.70"
This watertight, crushproof, and dust proof laptop case features a Pick ‘N’ Pluck foam insert with convoluted lid foam. It holds notebook computers up to 12.3” L x 9.3” W x 1.5” D along with 8.5” x 11” and A4 documents. A larger version of the 1080, this case holds notebook computers up to 14.4” L x 11.1” W x 1.7” D along with 8.5” x 11” and A4 documents. 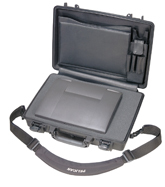 Interior Dimensions: 17.75" x 11.37" x 4.12"
This watertight, crushproof, and dust proof laptop case features a fitted shock absorbing tray and double safety locking latches for security and protection along with a lid organizer and shoulder strap for added comfort and convenience. It holds notebook computers up to 14.0” L x 10.8” W x 2.5” D.
Same as the 1490CC1 but includes Pick ‘N’ Pluck foam insert. 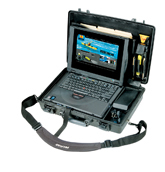 This watertight, crushproof, and dust proof laptop case features a fitted shock absorbing tray and a nylon padded computer sleeve and accessories pouch. Other features include a lid organizer, padded shoulder strap, and 3 dial combination lock. It holds most 17” notebook computers. Same as the 1495CC1 but includes Pick ‘N’ Pluck foam insert. Designed for the “road warrior”, the Pelican 1510 Laptop Overnight Case is ultimate piece of carry-on luggage ever designed. 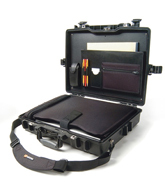 Designed to meet the maximum carry on size of the FAA, this case has interior dimensions of 19.75” x 11” x 7.60” and features a retractable extension handle with strong polyurethane wheels for ease of transport. Comfortable rubber over-molded top and side handles along with a detachable computer sleeve and accessories pouch offer added comfort and convenience. 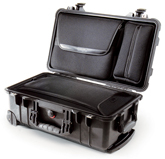 Like all Pelican cases, it also features its rugged watertight and crushproof construction and unconditional Lifetime Guarantee.